The cycle of our year, based on the Bible and the climate in the Bible lands, reminds us of an important life lesson – we may and should always hope that better times will follow the hard ones – and if that’s a cliché, well then, so be it. We sure needed that lesson this summer, with the spasm of violence that engulfed us. But the Bible teaches us this lesson first and foremost in the climate of the Holy Land itself. We haven’t seen rain for seven months or so; our land is dry and brown except by the most stubbornly abundant springs – one of the Bible’s most salient symbols of redemption. That’s what makes this whole season – beginning with Rosh Hashannah, the New Year – a time of hope. Read on, and you’ll learn about some Jewish wisdom and customs about this holiday that launches what we call our High Holy Day season, and more – how to surprise your Jewish friends with the special greeting for this time of year. You’ll also find out how to prepare a special holiday appetizer and desert. This year Rosh Hashannah falls on September 25 and 26, but according to the Hebrew (lunar) calendar it always falls on the first day of the Hebrew month of Tishrei. Yes, it’s the driest time of year. Even the bulb of the sea squill, its tiny white flowers lining its tall, elegant stalk – the first to sense the changes in the air that herald fall in the land of the Bible – have not yet awakened and poked through the earth. In the Bible, Tishrei was the seventh month of the year and its first day was a “holy convocation” (Num. 29:1). Bible folk considered the year to begin with the month of Nissan, in the spring (Exod. 12:2). In fact, there were different “new years” for different purposes. Over the centuries, Jewish sages have poured meaning into the variations in the dates. The Maharal of Prague (1520–1609) taught that Nissan represents the life force of the year (no doubt connected with spring) while Tishrei represents the renewal of the soul. A traditions going all the way back to the Talmud is that the first of Tishrei was the day on which God created the world (Talmud, Tractate Rosh Hashannah 11a). One of the most important customs of Rosh Hashannah, the blowing of the shofar – a ram’s horn – also has to do with celebration the birthday of the world. In fact, it is called “the Day of the Sounding of the Shofar” and marks our Ten Days of Repentance that culminate in the highest point of our spiritual year – the Day of Atonement. What’s the connection between the shofar and the birthday of the world? According to the ninth-century Rabbi Saadiah Gaon, since Rosh Hashannah commemorates the beginning of creation, “in which the Holy One, blessed be He, created the world and ruled over it…this is similarly done for kings, blowing trumpets before them… to announce and declare their reign in every place.” The reason for a ram’s horn – notoriously hard to get a sound out of, bring one to Bible study and give everyone a try, you’ll see what I mean – is apparently first mentioned in the Talmud by Rabbi Abbahu, who lived in Caesarea: “The Holy one blessed by He, said ‘Blow before me the horn of a ram, to remind you of the binding of Isaac.’” The connection, of course, is that Abraham did not sacrifice Isaac, but rather a ram he found tied to a nearby bush (Gen. 12:13). Tishrei, being the birthday of creation, is our opportunity to commemorate and celebrate the reverence for life that is at the very core of our Judeo-Christian heritage. I am often asked “how should we pray for Israel?” My answer is always: Pray for wisdom for our leaders, and for the leaders of this region. And in this season, may your happy birthday wish/prayer to the world be to increase liberty and justice for all. One Rosh Hashannah treat we serve at our holiday table is apple slices dipped in honey – as a symbol of a sweet year. Honey cake is often served for desert and makes a perfect hospitality offering too. And here’s a honey of a recipe – that goes back almost to the time of Jesus. The basis for the recipe is Song of Songs 2:5: “Strengthen me with raisins, refresh me with apples” (some Bibles translate apples as “flagons” whatever those are…). In the days of the Talmud, the sages were intrigued what this “raisin and apple love tonic” could have consisted of. Here’s what one rabbinic master, master chef that is, thought up, developed for your kitchen and mine by biblical and talmudic food expert Dr. Tova Dickstein and appears in my book Food at the Time of the Bible. 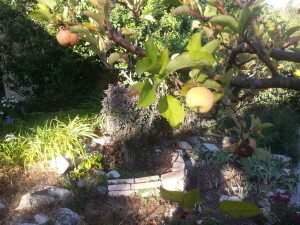 An apple tree in our front garden. Daughter Maya, now a mother herself, planted this tree when she was a toddler. Last year it gave no fruit and we were thinking it had run its course and would have to be cut down. But this year it bloomed and bore fruit again. An encouraging story of rejuvenation in honor of the New Year! Toast the lentils well in a frying pan. Grind them very fine into flour (Use a coffee grinder if available). Mix the lentil flour with the olive oil, making dough balls the size of ping pong balls. Flatten the balls into small pancakes. Heat additional olive oil in a frying pan and fry the pancakes gently on both sides until brown.